Please contact the owner directly @ 303-809-3714 or glastron195gls@gmail.com. 2009 GLASTRON BOWRIDER GLS 195 IN Storm Lake, IA 50588 25,550 About this 2009 Glastron Bowrider GLS 195 Runabouts 2009 Glastron Bowrider GLS 195, Only 40.5 hours on the boat. Cockpit and tonneau covers, bimini top, snap-in carpet, aft sun-pad and walk-through transom with filler cushion, twin bucket seats, AMFM radio with CD player. Beautiful, sleek looking Glastron sport styling. Price includes an E-Z Loader bunk trailer single axle with breaks. 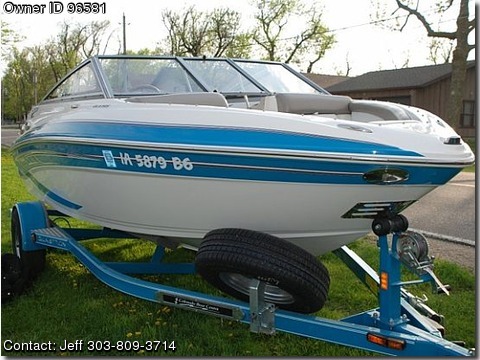 This boat has been professionally maintained and is a must see Great for a young family to do water sports activities.